Decorate your home with your very own personalized serving platter from I Love to Create. 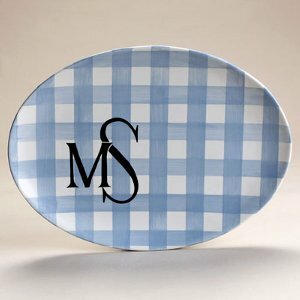 You can put your initials on the platter, your whole family's name or even your dog's name! Try making this really unique platter as a special gift for a wedding. Wipe platter with damp sponge to remove bisque dust. Lay strips of painter’s tape across plate leaving 1” space between strips. Make sure the edges are sealed. Using Fan Glaze brush, paint one thorough, even coat of Ice Blue across each open strip. Let dry well. Remove tape. Place new tape strips perpendicular from the first stripes, again, leaving 1” space between tape strips. Seal edges well. Brush one thorough, even coat of Ice Blue in the spaces. Let dry. Remove tape strips to reveal gingham checks. Create personal monogram by selecting favorite fonts from the computer, lettering book or creating your own. Enlarge to desired size and trace on to tracing paper. Flip over tracing paper, position where desired on platter and trace outline of letter to transfer monogram. Refer to photo. Using the No. 4 Liner, paint two coats Black in monogram. Sponge on two coats of Clear over monogram, careful not to smear the Black. Let dry between coats. Since this is completely new to me, it sounds fascinating but the step 11? is incomprehensible to me! Stilt plate & fire to Cone 6 needs more explanation!